Camera Shake adds some extra functionality to the standard Unity interface. The following article outlines each of these elements in detail. 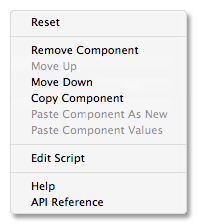 Clicking on the gear in every Camera Shake component will bring up a context menu. This menu contains some standard Unity and Camera Shake commands. It also provides a direct link to the online documentation. 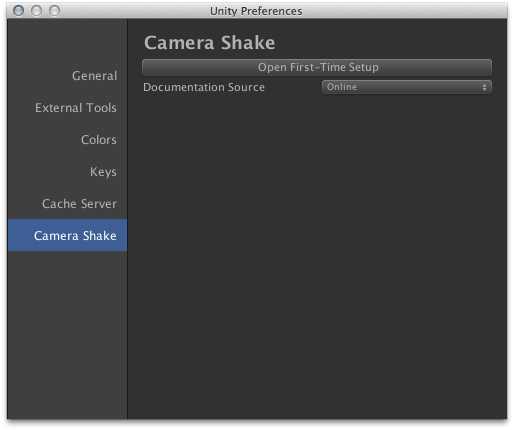 Camera Shake contains a preferences item to change per-machine settings, located at Edit > Preferences (Windows) or Unity > Preferences (Mac OS X). Here, documentation can be downloaded and stored locally.